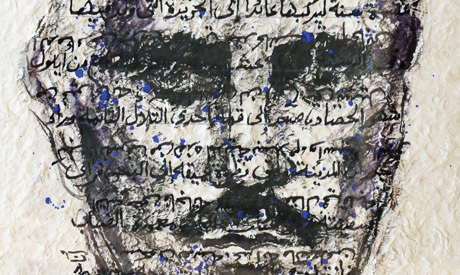 Sotheby’s gallery in London is opening a group exhibition titled Kahlil Gibran: Guide for our Times on 6 August, featuring nine Egyptian artists, along with 38 others from across the Middle East. The exhibition runs until 10 August, and is organised in collaboration with Caravan, an Egyptian initiative based in Chicago that curates touring exhibitions that promote peace and tolerance. The show is co-curated by Janet Rady and Marion Fromlet Baecker and is in partnership with The Arab British Centre. The themes and artwork are “inspired by the universal message of peace and harmony found in Kahlil Gibran’s poetry, writing, and art,” the exhibition statement by Caravan reads. Gibran’s best-selling book The Prophet celebrates its 95th publishing anniversary this year. The exhibition’s showing in London is a timely one, as Sotheby’s recently sold a collection of 33 letters by Gibran. London also conveniently plays an important role in Gibran’s history, as he paid a short visit to the city back in 1910, which sparked an ambitious plan to reconcile the faiths in the Arab world. “During Gibran’s short visit to London with two compatriots, plans for an opera house in Beirut were sketched showcasing two domes, one resembling a church basilica and the other featuring mosque minarets, symbolizing the reconciliation between the two religions,” the statement reads. A similar exhibition by Caravan was shown in Bahrain and Cairo, and this larger exhibition showcases some of the same works, while also adding new pieces by other artists. Marwa Adel, Hady Boraey, Yasser Rostom, Nagla Samir, Ibrahim El Tanbouli, Nazir Tanbouli, Wael Darwesh, Amina El Demirdash, and Reda Abdel Rahman, one of the founding artists of Caravan. Somaya Abdulghani, Ahmed Abdullah, Laudi Abilama, Sarah Aradi, Zena Assi, Dia Batal, Rana Chalabi, Wael Darwesh, Amina El Demirdash, Ahmed Emad Eldin, Taiba Faraj, Doaa Farouk, Nevine Fathy, Noora Fraidoon , Mariam Haji, Sameh Ismael, Christine Saleh Jamil, Nathaly Jung, Lulwa Al Khalifa, Ibrahim Khatab, Ghada Khunji, Mai Al Moataz, Farah Monfaradi, Amal Nasr, Zeinab Nour, Jamal A. Rahim, Omar Al Rashed, Ahmed Saber, Jehan Saleh, Abbas Yousif, Camille Zakharia, and Talar Aghbashian.